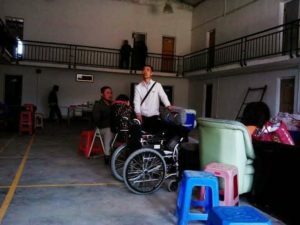 Authorities threatened to shut down a house church-run care center for the homeless, disabled, orphaned and elderly on March 19 in the southern province of Guangdong, claiming the center was housed in a building that was not legally registered. The Huizhou Loving Care Center, a branch of the original Christian care center in Shenzhen, Guangdong, expressed their concern that the local government is pressuring the group’s landlord in order to shut down the service. Staff said police came to the center on March 19, ordering the group to move out of the area. “We would like to keep the farm in Huizhou. The government said they wouldn’t let us live there, and they said they would demolish the house. Then, they said there isn’t a real estate certificate on the house, and it should be torn down,” Huang, the director of the Shenzhen branch, said.